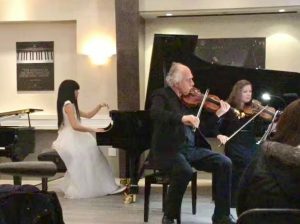 Thank you to everyone who joined us for Spring Harmonies on March 2 in our beautiful piano showroom at Tom Lee Music Richmond. 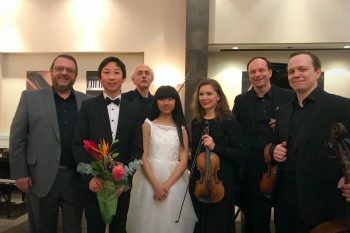 This delightful spring concert featured the breathtaking Rimsky-Korsakov String Quartet of St. Petersburg alongside accomplished young pianists Michelle Xu and Lin Kai Zhang. 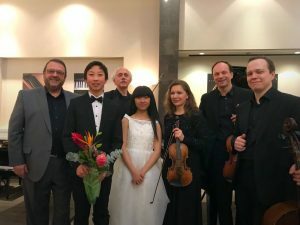 Both pianists are the recipients of impressive accolades, Michelle is a proud winner of the Pacific Youth Piano Festival and Lin Kai Zhang placed first in the Seattle International Piano Competition. 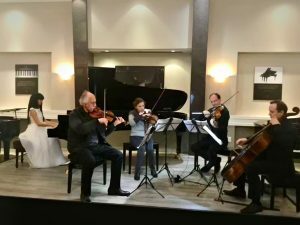 Their impressive programme featured two beautiful piano concertos by Frederic Chopin, Piano Concerto No. 1 in E minor, Op. 11 and Piano Concerto No. 2 in F minor, Op. 21. 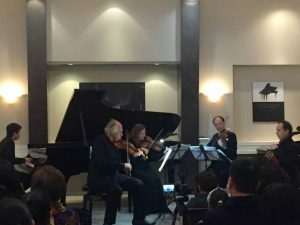 The audience was amazed by their virtuous performances and the concert was a resounding success. Attendees were treated to a light reception afterwards and celebration with the performers.